Arroz Blanco is a staple I keep in my arsenal. 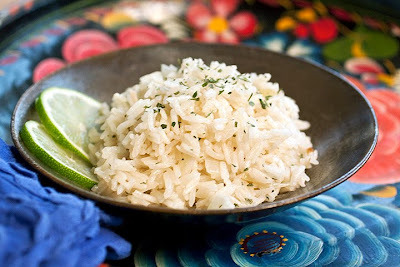 It’s a basic Mexican style rice pilaf to serve as a side or add to other dishes. Unlike its cousin Spanish rice, this recipe is tomato free. This weekend I served Arroz Blanco under saucy Pollo en Mole Verde, but it’s also a nice side for fish dishes. Hot toasted pilaf is hard to resist. 1. Heat the oil to a large skillet over medium high. Add the onion and cook for 2 minutes. Add the rice and cook until most of it turns translucent and some of the kernels start to golden brown. 2. Add the garlic, parsley, salt and lime juice. Cook for 30 seconds until garlic is fragrant. Add the broth and bring to a simmer. 3. Turn the heat to low and cover skillet. Cook for 17 to 20 minutes. Turn off heat and keep covered for 5 minutes before serving. Note: For a vegan version use vegetable broth. I am soooo behind on your posts. I missed fettucini, gnocchi and the diplomatically titled People's Chocolate cheesecake!!!! You are moving right up from Texan in training to full-fledged southern girl. I'm working on it Mari. Maybe Texas will accept me into their state soon. I love rice, and I make it every day at home. Love the picture Laura. How festive for Cinco de Mayo! I always have no idea what side dish I should make with Mexican food. Laura to the rescue! I need to try this alternative to Spanish rice. It looks more fresh and light! I've never made this--I will try it with my next Mex meal! This is so much different from my usual take on Mexican rice! I'll have to give it a try! Yum! Pass me a margarita! CIlantro is a great idea. Love cilantro!